Washington, D.C. — As summer begins and the July 4th holiday approaches, the Consumer Federation of America (CFA) is issuing an alert to off-highway vehicle (OHV) riders to operate their vehicles with caution. According to data gathered by CFA and its OHV Safety Coalition, July is the most dangerous month for OHV riders. 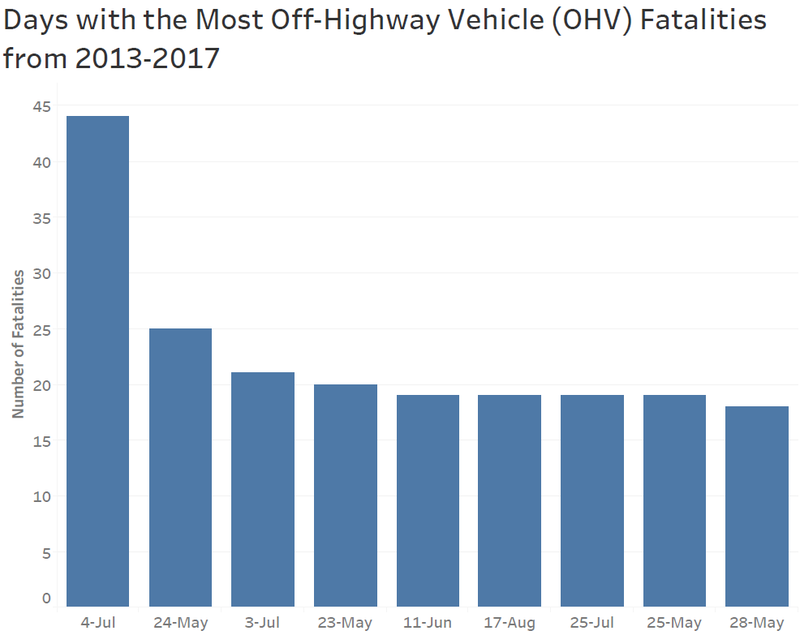 From 2013 through 2017, July has been the month with the most OHV fatalities, and the day with the highest number of fatalities is July 4th. August and May follow as the second and third most dangerous months for OHV riders. CFA and its OHV Safety Coalition have been documenting OHV deaths since 2013. Using media reports and government data, the Coalition compiles and documents information on fatalities, and makes its findings publicly available. From 2013 through 2017, the Coalition documented over 400 deaths in July. For the entire time period, CFA has documented over 3,000 deaths. While these numbers are high, these data are not yet complete and will likely increase as additional information becomes available. OHVs are comprised of all-terrain vehicles (ATVs), recreational off-highway vehicles (ROVs), and utility task vehicles (UTVs). 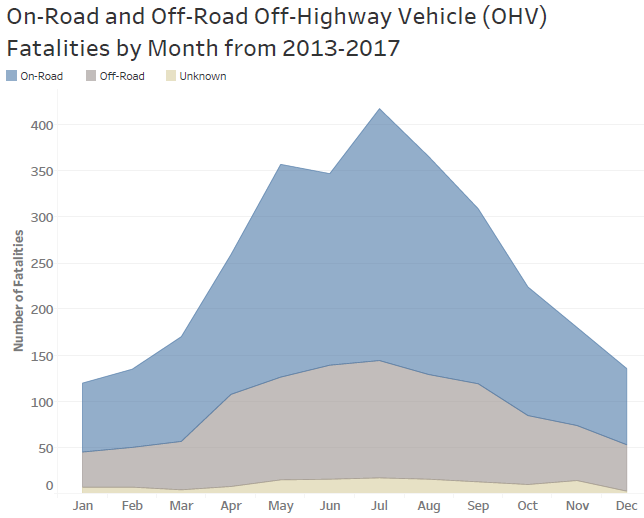 The chart below shows that from 2013 through 2017, OHV fatalities peak during the month of July, with 417 fatalities. OHV fatalities are also broken into two categories: on-road fatalities and off-road fatalities. Of the 417 fatalities that occurred in July, 273 (65%) occurred on-road, 127 (30%) occurred off-road, and 22 (4%) occurred in an unknown location. CFA data from 2013 through 2017 shows that most fatalities occur on July 4th as compared to every other day of the year. CFA documented 3,023 deaths in total from 2013 through 2017. Of those deaths, 1,890 (63%) occurred on-road, 999 (33%) occurred off-road, and 134 (4%) occurred in an unknown location. The Consumer Product Safety Commission (CPSC) released its most recent ATV fatality and injury report in December 2017. The CPSC received reports of 337 ATV fatalities in 2016. In 2016, CFA data included 515 ATV fatalities. The CPSC is continuing to collect ATV fatality data. The CPSC does not collect annual ROV or other OHV data, and CFA has urged the CPSC to collect and publicly release annual ROV data. CFA has been working to minimize deaths and injuries from OHVs for decades, in large part by convening a coalition to prevent OHV road access, and with that coalition, compiling fatality information in real time. CFA has also petitioned the CPSC to ban adult-size ATVs for children, and urged the CPSC to collect annual ROV data, among other requests to the agency to take steps to reduce OHV deaths and injuries. Never operate an OHV on a road. Never permit children younger than 16 years old to operate an adult-size OHV or any OHV that is too large and too powerful for them. Always wear a helmet and other protective gear when riding an OHV. Always wear safety belts when available in the vehicle. Never allow more people on an OHV than it was designed to carry. Never ride when under the influence. Take a hands-on safety course. Our partners at Prevent Child Injury have recently issued an important ATV safety toolkit aimed specifically at helping parents learn about the risks of children using ATVs. “These machines weigh hundreds of pounds and can travel at high speeds. Decisions about risks often have to be made in a split second. Unfortunately with ATVs, one wrong choice can lead to a trip to the emergency department or worse. Because of this, we encourage parents to think twice before letting a child younger than 16 years old use an ATV,” said Dr. Gary Smith, President, Child Injury Prevention Alliance. CFA and the OHV Safety Coalition collect fatality data from news reports, game or natural resource crash investigations, state crash investigations, as well as data from the CPSC, Occupational Safety and Health Administration (OSHA), and National Highway Traffic Safety Administration (NHTSA). CFA data is likely an underestimate of actual fatalities and CFA consistently updates the data as more information is obtained. CFA makes this data publicly available on our website.